Driving out of Durban, we were full of nervous excitement as we began the Africa leg of our journey. It felt so good to be on the road again – the month long wait had felt like forever and the additional time to over-think everything can drive you slightly mad! Our first destination would be Lesotho – the mountain kingdom – a tiny little country within South Africa that sits above 2,500m. We thought there’d be no better way to bed the car in, than to take her for a spin up to the mountains – the Sani Pass – claims to be one of the toughest roads in the world, so we thought that it would be a good test for us and the car! 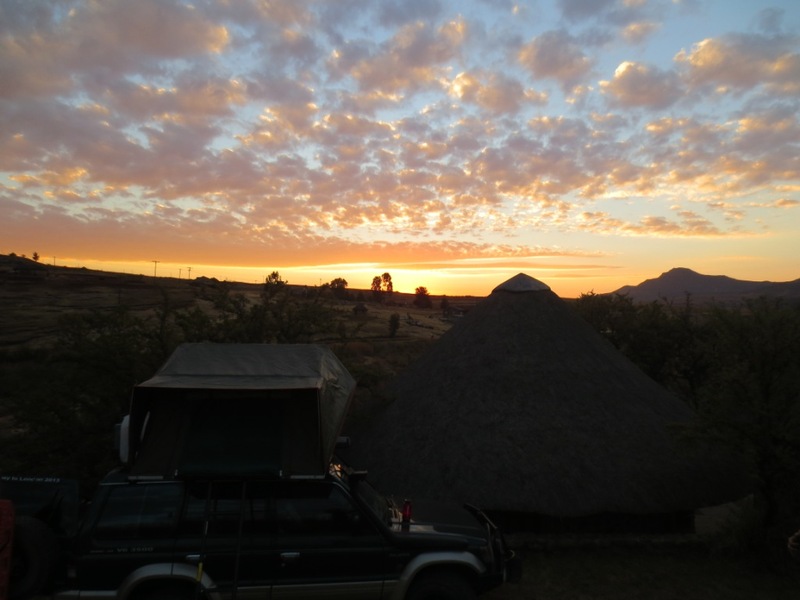 The drive up to the Drakensburg was stunning, and we made our first camp in Africa in the garden of the Sani Lodge at the bottom of the pass – not surprising we were the only ones there as it’s currently winter and temperatures at night are around 0 degrees! Fortunately our sleeping bags are very cosy and i was really glad that we did end up bringing a hot water bottle!!! Usually at this time of year Lesotho is covered in deep snow, but fortunately for us it’s been warmer than usual lately, so only frosts to contend with, but snow is on its way apparently! Driving up into the pass was absolutely breathtaking – the photos just won’t do it justice – and no matter how many adjectives i throw in here, i don’t think i can convey just how amazing it is. 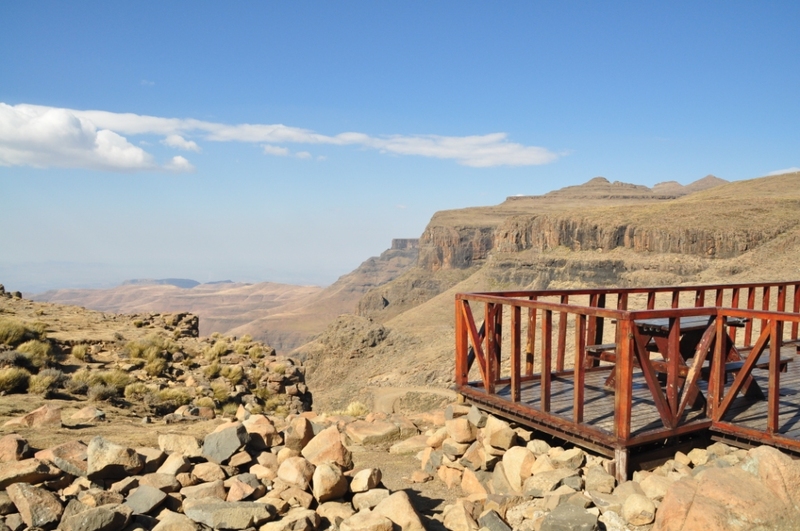 The Sani pass starts fairly gently and the first stop is the South African border control – our first one! 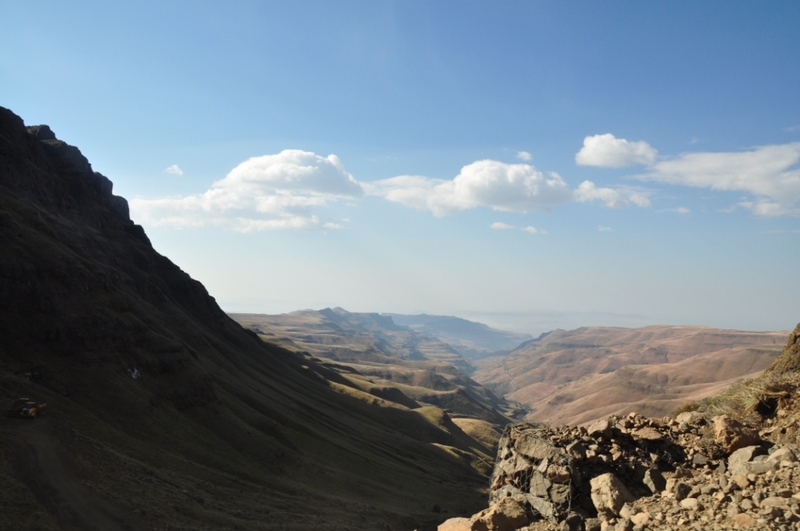 It was all very straightforward and they only wanted to see our passports and not the carnet – the remainder of the pass then winds on through no-mans land as the official border of Lesotho doesn’t start until the top! The drive up itself is pretty easy, it’s only really the last 400m climb that gets your hair standing on end as the switch backs get tighter and tighter and the gradient hits about 30 degrees, not forgetting the sheer cliff on one side. That said, it’s not as bad as people say and despite slight reservations as to whether our fully loaded, 17year old Pajero would be capable, she absolutely flew up with little encouragement. Reaching the top was just such a huge wave of relief and joy, that not only had we made it to the top 2873m – but we’d done it in our car! 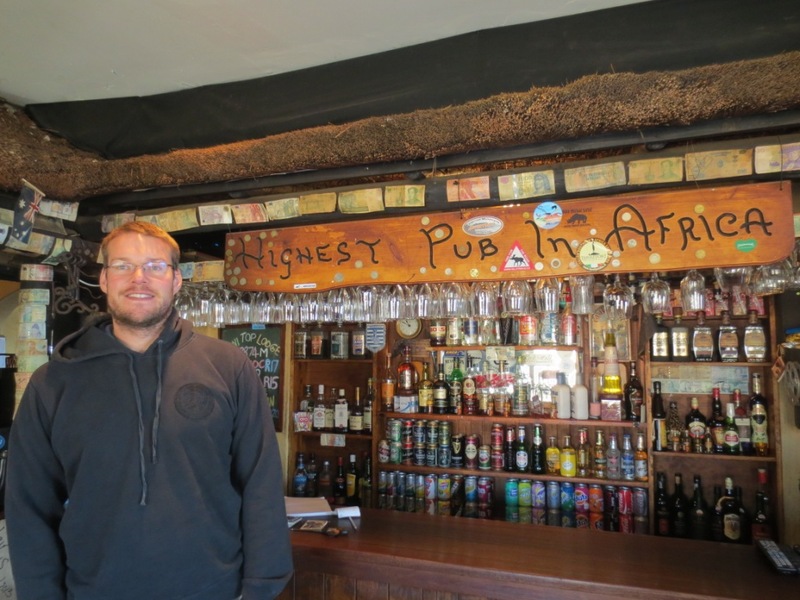 We passed through the Lesotho border control, again all really easy, and headed straight for the highest pub in Africa at Sani Top Lodge – we definitely needed a beer after that, even though it was only 10am! We spent the rest of the day driving across the mountain passes – the roads are very rough and slow going, but it was just lovely to bumble along and take it all in. 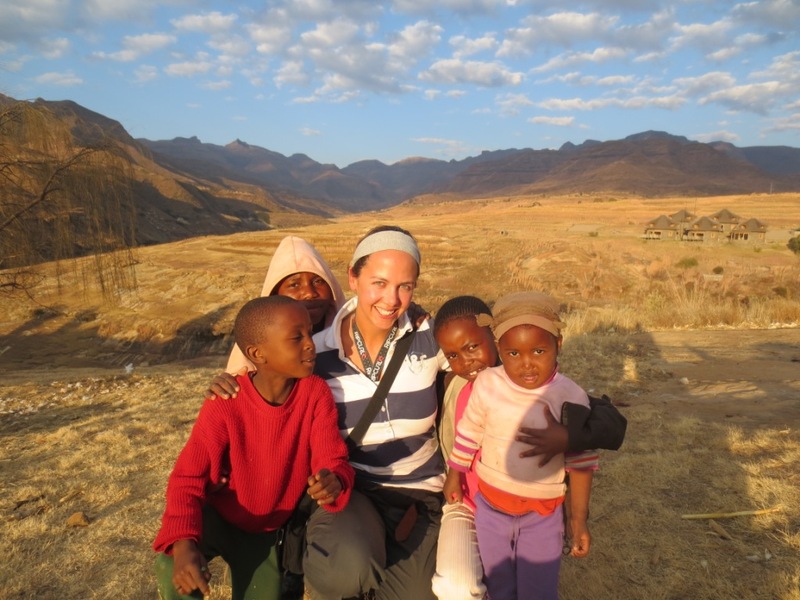 Lesotho is one of Africa’s poorest countries and driving through the villages it seems like the place that time forgot. Most people live in the traditional ronadavels (round huts), most don’t have electricity and the land around them is still farmed in the traditional way with only simple equipment. 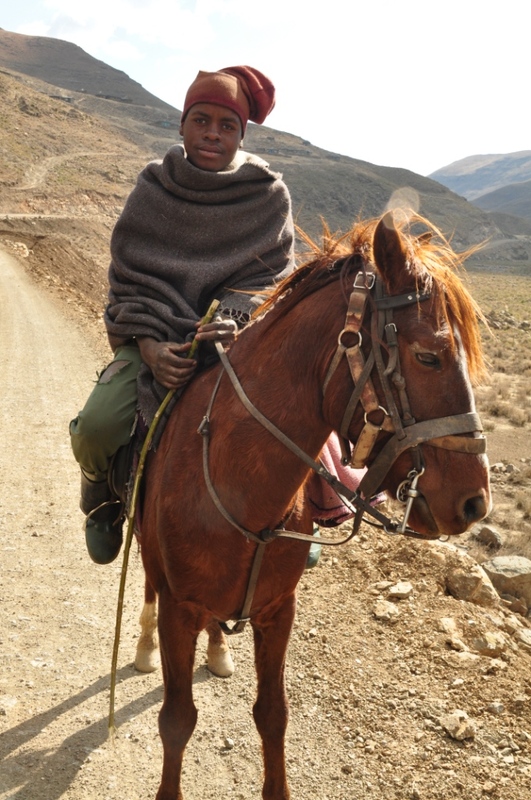 Animals are a precious resource here, the most common form of transport are the Basotho ponies – it was amazing to watch the boys riding them across the steep mountains, herding their assortment of sheep, goats, cows and donkeys. 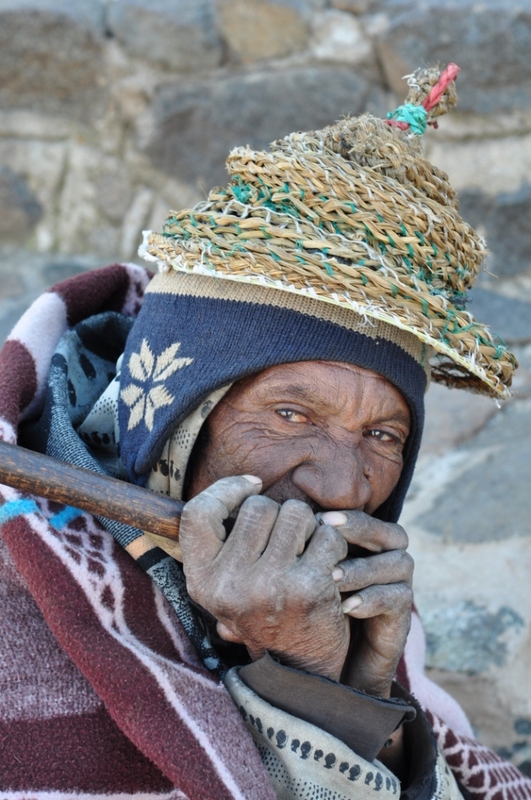 The shepherds cut a more sinister figure, wrapped up in the traditional Basotho blankets and full faced balaclavas so you could only see their eyes – we kept up the ‘smile and wave’ tactic and they almost always waved enthusiastically back! Unfortunately one annoyance we’d read about, was the begging children. The early French missionaries, wanting to make peace with the locals handed out sweets to the children – ‘Bon Bon’ – has now become ‘Pom Pom’ and as you drive up towards any village, the children all come scampering down the hillsides shouting ‘Pom Pom’ or ‘Sweeeeeets, Sweeeets’. We’d be told not to give into the begging as it only makes it worse – so we just waved back to them – sometimes the outstretched palms turned into waves back, but sometimes they turned into shaking fists!! We felt so guilty!!!!! It would take a harden soul to drive past any child standing out in the cold, asking for sweets while you drive past in your nice warm car!! We decided that we’d try and contribute in other ways by ensuring we tipped those who helped us well and buy from local stalls. It took us over 2hours to drive about 50km and so we called it a day early and found the closest place to camp which was at St James Mission, who let us stay in the grounds of the little guest lodge and use the facilities there. For an extra 50R they made us a fire (there are no trees at this altitude, so wood is precious!) and we spent the evening sheltering from the cold inside the lodge where we ate and read by candlelight as there was no electricity. It was so peaceful and with no lights anywhere, the stars at night were incredible. The next day we continued our drive north, we would have loved to ventured into the middle to the Katse Dam but the slow going would mean adding at least 3 more days on, so we stuck to the west side and travelled the ‘Roof of Africa’ route, most of which is above 3,000m! We visited Liphofung Cultural reserve where a guide took us to a beautiful sandstone cave that contained original ‘San’ paintings which are very much like the original aboriginal paintings in Aus but not as old. We decided to stay at the centre as they had a small grass patch we could camp on and once settled, it was still early afternoon so we decided to go for a walk to one of the nearby villages. We had read that the villages use a coloured flag system to show what you can buy there – white for beer, yellow for maize, red for meat and green for veggies. Typically, Richard had spotted a white ‘local beer’ flag in the distance, so off we went. Walking up to the village we met a group of children, who seemed to find our presence hysterical, but fortunately amongst the laughter one small girl stepped forward and in perfect English said ‘Good afternoon, how are you today’. The rest of the group found this even more hysterical and there seemed to be a lot of teasing her for being able to speak to us. Richard seizing on the opportunity of having a translator straightway responded with ‘I’m excellent thank-you, but can you show me where i can buy some beer’. She skipped forward and beckoned us to follow, so us, along with 10 or so other kids all tailed on behind until we reached a gate where the little girl told us to wait. She ran off to the nearest huts to let them know we were here and suddenly the hut erupted with shrieks and screams. Women began to pour out of the hut, laughing and smiling, with their arms raised and shrieking ‘Yi-yi-yi-yi-yi-yi’ and running towards us to welcome us! It was the most unbelievable moment and so unexpected. 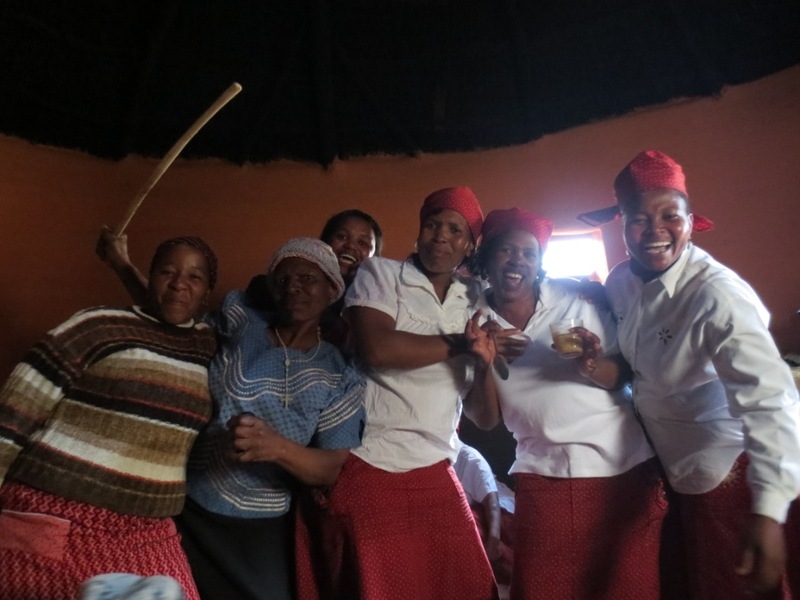 The women formed round us, laughing and shrieking and ushered us into the small round hut. Unbeknown to us, we had just gatecrashed their monthly ladies ‘co-operative’ meeting and the inside of the hut was packed with women of all ages and their babies. 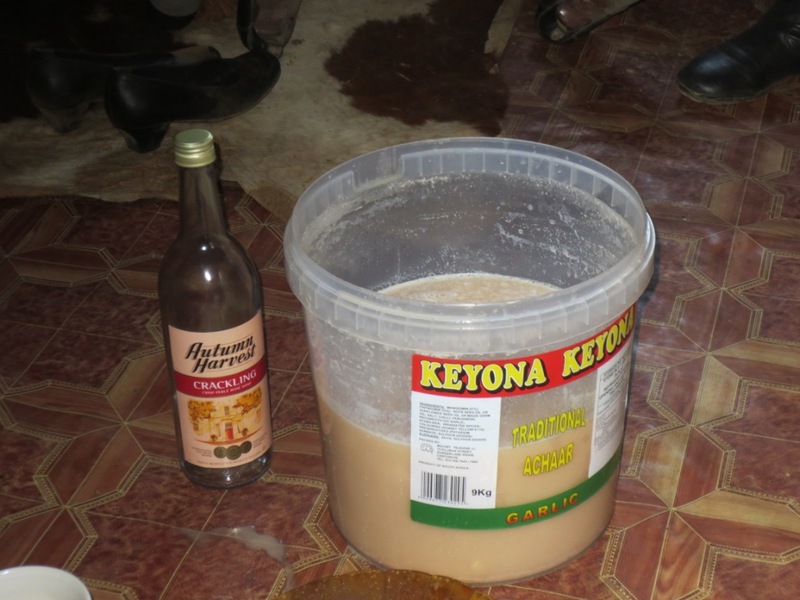 They sat us down and gave us cups of their home-brewed beer, a watery porridge looking liquid that they scooped out of the huge bucket that was sitting pride of place in the centre of the hut. They were all tucking in, so no wonder the welcome had been so energetic! Rich and i looked at each other nervously, all eyes were on us waiting for us to take a sip. Oh well, ‘Bottoms up!’ It was like rocket fuel, the colour hitting our cheeks immediately! There were cheers all round, then the music was turned up and everyone was up dancing and singing – all lead by the oldest lady in the group who must have been mid-70’s! She could move her hips better than any 21year old i’ve seen, and their singing was just beautiful. It was the most surreal couple of hours of my life, but we felt so humbled to be invited into their home like this. It turns out that many women club together to form ‘Co-operatives’ where each month they contribute as much money as they can to the kitty which is then used to buy groceries for the group. It means that if someone is having a difficult month they will not go hungry. For many women, their husbands are working in South Africa in the mines and so the money they raise is purely off what they have earned themselves. They were so proud of all the money they’d raised that day, they even wanted us to see all the money – ‘Look, we did this, 7,000R, all our own, with no men!’. We contributed further to their fund by buying some of the beer (not that we were brave enough to drink much more! )but wanted to seem willing! We left light-headed and giddy, home brew combined with such an intense and unexpected experience we walked home in a happy daze. Watching the sunset over the mountains, we could still hear the beautiful singing in the distance and we both just sat in silence with huge smiles on our faces! I know not everyday will be like this, but even if only some are, we are going to really love this place. Not a bad view from the pub garden! Local beer – would you be brave enough to try? Looks like your already having a fantastic time! I look forward to the next installment! Stay safe! Thanks Jen. That was a great start for us. R.
wow – what a start to Africa !! Thanks Neil, it was special. R.
Unfortunately it Looks like the spot tracker coverage is non-existent in South Africa.hopefully the signal will improve as we head into Namibia.currently at Addo Elephant park at the start of the Garden Route heading towards Cape Town.